Some common habits resemble simple prisms. 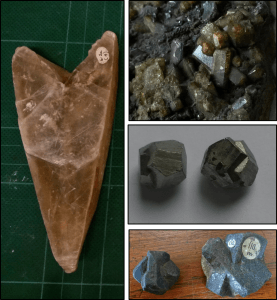 Luckily there is a handy specimen in the collection that contains the three classic cubic minerals: pyrite (small golden cubes) crystallised on galena (dark grey cubes) and fluorite (translucent cubes). Hexagonal habits form simple, six-sided prisms. Quartz is the most common mineral with this habit, while aragonite appears hexagonal due to twinning – this is referred to as a pseudohexagonal habit. 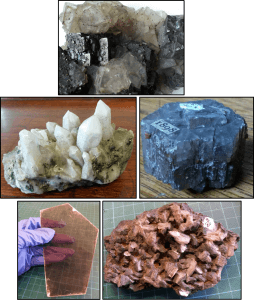 Platy minerals have layered crystals that can be easily broken into individual sheets. 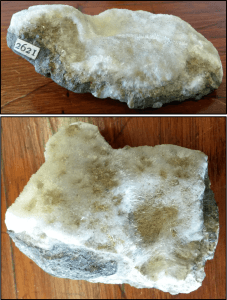 Mica is the most well-known one but I came across talc with large, platy crystals; this is both surprising and rare because talc usually has microscopic crystals. Acicular habits (from Latin meaning ‘little needle’) consist of elongated crystals with tapered ends. If the crystals are fine enough, it can give the mineral a fluffy appearance which is why I decided to sneakily tweet some pictures of acicular minerals under the #TeamFloof hashtag. Despite their soft appearance, it’s not a good idea to stroke these minerals since they’re fragile and quite sharp! Botryoidal habits (from Greek meaning ‘bunch of grapes’) occur when a mineral grows radially around a nucleus such as dust. 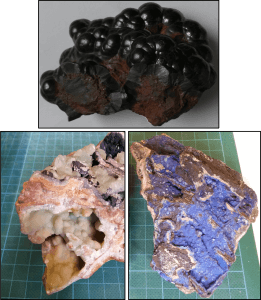 Haematite is a classic example of this habit but smithsonite and azurite also have botryoidal forms. 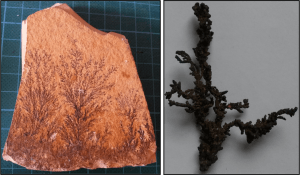 I think my favourite habit is dendritic (from Greek meaning ‘tree’) because it forms fractal patterns and is the result of the same process as snowflake formation. When material is below its crystallisation temperature, branches form instead of proper crystal faces. Twinning can lead to various interesting morphologies and is the result of two crystals with different orientations sharing the same crystal lattice points. Twinning can be caused by disrupted crystal formation, deformation or a change in conditions which favours a new structure over the original one. Some minerals are more susceptible to twinning than others. Pseudomorphs are formed by a substitution process where an original mineral is either replaced by a new one or altered into something else. This means that the original shape is preserved but all other properties are changed. When describing pseudomorphs, the naming process is ‘replacer after original’ e.g. limonite after pyrite. Fossils have usually undergone a pseudomorphic process. Petrified wood forms when silica replaces organic matter and retains the original wood grain pattern. Ammonites replaced by pyrite are another example of a pseudomorph. This list of habits isn’t exhaustive – I’ve seen a lot more during my time in the Rock Room. Since many minerals have similar colours, e.g. purple fluorite and amethyst, habits can be a quick and easy way to identify minerals by eye. To finish, I thought I’d list a few minerals with unusual morphologies. The shape of babel quartz is caused by other minerals inhibiting its growth; this mineral is named after the ancient Tower of Babel which has a similar shape. Sand rose is a type of gypsum with rosette-shaped crystals rich in sand. The specimen pictured is from Eocene-aged deposits in Canterbury, Kent. The strangest mineral I’ve found so far is mesolite shaped like a shuriken. 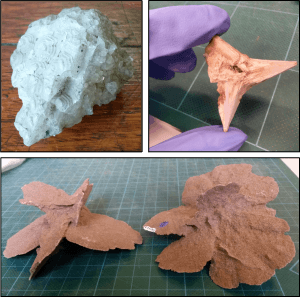 I assume its shape is caused by twinning but I’ve never seen anything like it before – that’s the great thing about working with the geology collections, every drawer is filled with a surprise! Nadine Gabriel is a Collections Assistant at UCL Museums and a 4th year Geology student.